Habit: Annual (rarely short-lived perennial herb) 2--60 cm, puberulent to rough-hairy and glandular. Stem: simple to much-branched. Leaf: generally alternate, petioled; blades 2--10 cm, ovate, round, or triangular, coarsely toothed to palmately lobed, teeth and lobes generally again toothed or lobed. Inflorescence: heads radiate (rarely disciform), 1--many; peduncle 0.1--7 cm; involucre hemispheric to bell-shaped; phyllaries many, 5--6 mm, lanceolate or oblanceolate to ovate. Ray Flower: generally 8--14; ray 1.5--4 mm, white, rarely vestigial. Disk Flower: corolla 2--2.5 mm, yellow. 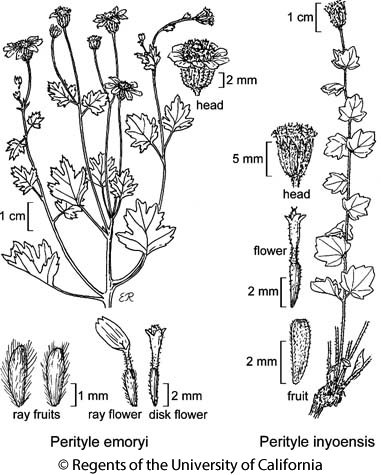 Fruit: generally 2--3 mm; margins thin, ciliate; ray fruit faces generally +- puberulent; disk fruit faces generally glabrous; pappus scales well developed or vestigial, bristle 0 or 1, 1--2.5 mm. Chromosomes: 2n=64--72, 100--116. Citation for this treatment: David J. Keil 2012, Perityle emoryi, in Jepson Flora Project (eds.) Jepson eFlora, http://ucjeps.berkeley.edu/eflora/eflora_display.php?tid=4303, accessed on April 24, 2019. SCo (uncommon), ChI, PR (uncommon), D; Markers link to CCH specimen records. Yellow markers indicate records that may provide evidence for eFlora range revision or may have georeferencing or identification issues. Purple markers indicate specimens collected from a garden, greenhouse, or other non-wild location.